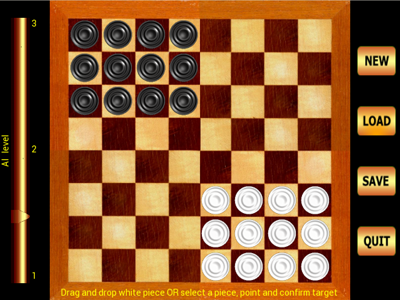 A 3x4 version classic board game. The goal of the game is to get all your checkers to the opponent's house. The player who does this first wins. Each player can move one checker per move. 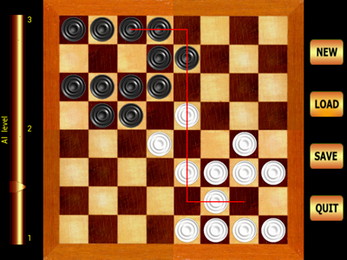 The checkers can be moved in any direction to adjacent empty square. It is possible to jump over your own and your opponent's checkers. This game is suitable for players of all ages and any temperament. 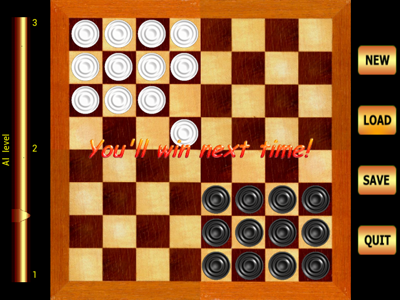 It uses the adaptive AI - time spent to opponent’s move depends on the time spent by you for your move, processor capacity and AI level selected on the left slider. More time you need to make your move – more time you give to your opponent. Anytime you can close the game by tapping Quit button. Current position will be saved, so when you load the game next time you start where you left off.